Lanzone fruit is a sweet, delicious, round to oval shaped berry native to Malayan Peninsular tropical fruiting trees in the Mahogany family. Its refreshingly sweet and tangy flavor is liked by many fruit lovers in the South East Asian countries. Scientific name: Lansium domesticum Correa. It is chiefly grown in the Malaysia, Indonesia, Philippines, Thailand and Brunei. Some of the common names are Duku, langsat, lansa, langseh, langsep, lansone, or kokosan, etc. Langsat fruits. Note for peeled, segmented white-aril inside. Lanzone tree grows well under tropical humid environments. It is a long erect plant which begins to yield after about 4 years of plantation and continue to bear fruits for over 100 years. Duku, longkong, paete and Jolo are popular cultivars among the farmers. Small, yellow flowers appear from April to June, which develop into greenish berries in clusters. The fruits are ready for harvesting between August and November when their surface color turns brownish yellow. Each lanzones berry measures about 3.5 to 4 cm in diameter with thick, hairy outer skin. The leathery skin in raw unripe fruits emits clear milk-like resin. Inside, the segmented fleshy aril is almost gel-like, semi-translucent. It s flavor is sweet and lightly acidic like longan or lychee, juicy and refreshing. The seeds are soft, bitter and should be discarded. Fresh lanzones fruit carries 57 calories per 100 g of edible portion. It has no saturated fats or cholesterol but composes of good amounts of dietary fiber, vitamins, and antioxidants. Fresh arils contain only a fewer polyphenols antioxidants. However, its skin and seeds contain abundant polyphenols. Quantitative analysis showed that lanzone peel had the highest total flavonoids (213.45 mg quercetin/g dried material) among tropical fruits. The fruit is very juicy and refreshing. Its simple sugars, fructose and sucrose, boosts energy and help revitalize through electrolytes, minerals and vitamins. Its fresh arils hold small amounts of vitamin-C (just 2 mg/100 g). It carries good amounts of dietary fiber, 0.8 g per 100 g. Good fiber diet help control cholesterol levels and body weight. Fresh fruits are very good source of B-complex vitamins such as thiamin, riboflavin, niacin, and folates. These vitamins are essential since they function by acting as co-factors to help the body metabolize carbohydrates, protein, and fats. Further, it also carries small amounts of minerals like calcium (19 mg), phosphorus (31 mg) and iron (0.9 mg). Being a juicy tropical fruit, it holds good amounts of potassium, an important component of cell and body fluids help control heart rate and blood pressure; thus, it offers protection against high blood pressure and stroke. Langsat fruit (Lansium domesticum), Fresh, Nutritive value per 100 g, (Source: Langasat production guide). Fresh langsats season begins by August in Malaysia and Philippines. In the Philippines, Camiguin lanzones festival is celebated every year in the third week of October to commomemorate the bountiful supply of fresh fruit harvest. Fresh arrivals can be readily purchased either from the supermarkets, or fruit retailer shops. Choose round to oval berries clusters instead of loose berries to ensure the freshness and for extended usage. Ripe berries just yield to thumb pressure. Avoid unripe, green tinged berries as they are very sour and unappetizing. Also avoid over-ripen, soft, spotted, surface cuts and damaged berries. Lanzones perish early and should be eaten early soon after their purchase. At room temperature, they can be kept for 3-4 days, and inside the home refrigerators for up to one week. At home, place them in cool place in a fruit bowl, occassionally moistened to keep them from drying. They are very refreshing if eaten while fresh. Wash them in cold running water to remove any surface dirt, sand and ants. Rinse in water for 10-15 minutes. Mop dry using a clean towel. Make a superficial cut near the stem end using thumb and gently peel away the skin. Ripe lanzones are eaten raw out of hand. Just peel the outer skin using fingers from the stem end side to expose juicy colorless arils inside. Put the whole arils in the mouth, do not bite, but gently squeeze out seeds as you do in cases of lychee. Enjoy the sweet and tangy arils and spit out seeds. 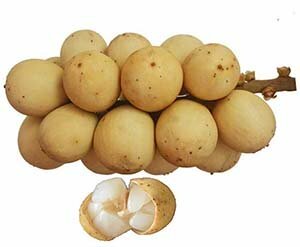 Lanzones are one of the popular summer dessert fruits in the Philippines, and Malaysia. Fresh fruits should be enjoyed all alone without any additions/seasonings. Its sections go well in fruit salads with other complementing tropical fruits like lychee, rambutan, snake fruit, etc. Langsat can be juiced and used as a refreshing summer drink. As in litchis, it also can be used in jellies, jams, sorbet, sauces, candied, and syrups. Eating raw fruits is undesirable as it contains tannins, and therefore causes bitterly astringent effect on the tongue, palates and throat. Although not life threatening, chewing langasat seeds can cause bitter aftertaste and unpleasant sensation. Pregnant woman can enjoy the fruit, but avoid chewing seeds. People with diabetes may want to avoid eating too much of them at one go because of their high sugar content. (Medical disclaimer). <<-Read Rambutan nutrition facts and health benefits. <<-Read Lychee (litchi) nutrition facts and health benefits. <<-Back to Fruits from Lanzones. Visit here for an impressive list of all variety of fruits with complete illustrations of their nutrition facts and health benefits. TOTAL FLAVONOIDS, TOTAL PHENOLICS AND VITAMIN C: INDICATORS OF THE ANTIOXIDANT POTENTIALS OF SELECTED FRUIT PEELS.-pdf.